Course Description: This course enables students to examine the factors that influence their own health practices and behaviours as well as those factors that contribute to the development of healthy communities. It emphasizes the concept of wellness, which addresses all aspects of well-being – physical, cognitive, emotional, spiritual, and social – and promotes healthy eating, physical activity, and building and maintaining a positive sense of self. 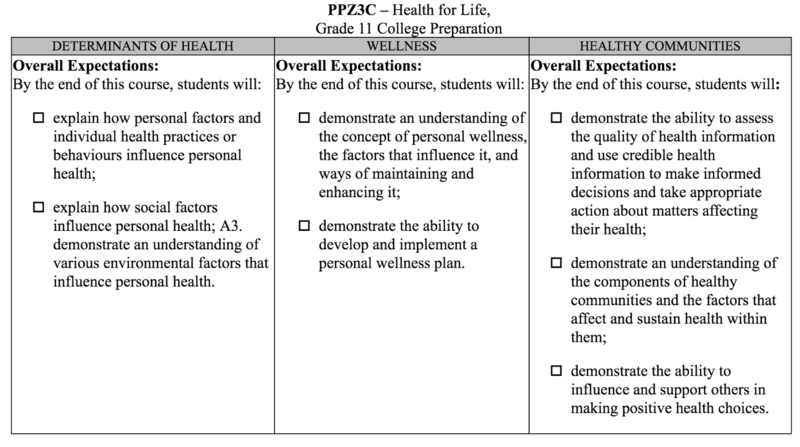 Students will develop the skills necessary to make healthy choices and create a personal wellness plan. They will also design initiatives that encourage others to lead healthy, active lives. The course prepares students for college programs in health sciences, fitness, wellness, and health promotion. Unit One: Live your Best Life! In this unit students will analyze their current health behaviours, become aware of their strengths and weaknesses, and set personal goals through the development of a Better Me Action Plan. In this unit major topics include: Personal influencing Factors , Personal health practices, Social and economic influencing factors, physical influencing factors, health care system influences and the interrelationship between these factors and your health. In this unit students will assess health-promoting products, health products, health information, and they will learn about nutrition labeling and their regulations and about alternative health care practices. Students will explore and analyze the impact of policies and government regulations as they pertain to overall health. In this unit students will investigate the transmission, treatment, and prevention of communicable, chronic, and food-borne diseases and ailments. Students will receive basic first aid training for emergency situations. Finally, students will explore workplace health issues. In this unit students will examine and evaluate community health services (e.g. public health units, community agencies, mental health facilities) and facilities that encourage healthy, active living (e.g. recreation and fitness centres). Students will also identify and investigate health-related career opportunities. Students will demonstrate evidence of their learning in the course by completing, reflecting on, and presenting their Better Me Action Plan, completing and reflecting on their Community Health Advocacy Task, and examining their understanding of the Better Me Concept by reflecting on a visit to a retirement home in their community. This project is worth 30% of the final grade.